The Harold I. Schiff Lecture series was established in honour of late Professor Emeritus Harold I. Schiff, who was York's founding dean of the Faculty of Science in 1968. Among his numerous achievements are his major contributions to the development of techniques for measuring trace constituents in the upper atmosphere and to the interpretation of the physics and chemistry of the stratosphere. 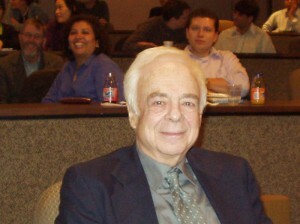 An educator and scientist in the field of chemistry, Schiff began at York in 1964 and was named a member of York’s Founders Society in honour of his contributions to the early development of the University. While at York, Schiff was chair of the Department of Chemistry and director of the Natural Science Program in 1964, dean of the Faculty of Science from 1965 to 1972 and director of the Centre for Atmospheric Chemistry from 1985 to 1989. The Annual Harold I. Schiff Lecture is organized by the Centre for Atmospheric Chemistry at York. For more information, e-mail cac@yorku.ca.